For many people, shaving is a regular part of their grooming routine. Whether you are experienced in shaving or you are relatively new to it, most people who shave have experienced razor burn. If you have experienced razor burn before, then you probably already know that it can be painful and uncomfortable. This article will provide some easy steps to treating razor burns. To treat razor burns, know exactly what they ares. Basically, a razor burn is a skin irritation that takes on the form of a rash or, in worse cases, razor bumps. The rash normally appears two to four days after shaving. 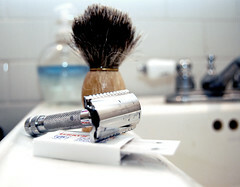 Usually, razor burns occur when improper shaving techniques are used, such as applying to much pressure when shaving, not using enough lubricant, shaving against the grain, or shaving quickly. Remember to always make use of proper shaving techniques to prevent razor burns. Now that you know about razor burns, you are better prepared to treat it and prevent it. Perhaps the best way to treat razor burn is to apply a soothing solution or gel. Witch hazel, salycylic acid solutions, and aloe vera gels are great for healing and soothing razor burns. For a quick fix, you can rinse the area with cold water to relieve pain. Warning: Try not to self-medicate by using just any type of soothing gel or cream, as they may cause more irritation. Another option is to visit a dermatologist who can assess your razor burn and suggest a medicated shaving gel or cream that can help prevent or treat razor burn. Perhaps the most important step to treating razor burn is to take proper preventive measures to ensure that it doesn’t happen again. Always make use of a sharp shaver, preferably a new, single razor shaver. Using a sharp razor will eliminate the need to apply pressure. Wash the area well and apply a good amount of shaving cream or gel to lubricate the skin and soften the hair. Be sure to always shave with the grain. Finally, use a good moisturizer after each shave to keep your skin soft and feeling good. Try not to use perfumes or anything that may cause irritation to the skin after shaving. Treating Sunburn – All about treating different types of burns. First Aid for Burns – On how to deal with burns. First Aid for Sprain – All about applying first aid and treating burns. First Aid Kit – About first aid and issues concerning it. Natural Skin Care – About skin care and other skin care-related issues. First Aid – All about first aid and other emergency-related things.